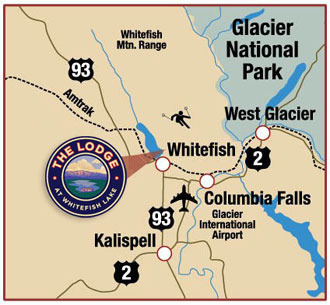 Glacier Park International Airport (FCA) is just 19 miles from Whitefish Mountain Resort and is served by three major airlines: Delta, Northwest and United. This historic railroad-turned-ski town is still a major stop for Amtrak. Trains from the West Coast arrive at Whitefish at 7:30 a.m., leaving time for you to hop on the S*N*O*W* Bus—the complimentary Shuttle Network of Whitefish that runs a circuit around the town and the mountain resorts—and arrive at the slopes in plenty of time to rent equipment, have a hot breakfast at the main lodge and still make the first chair. 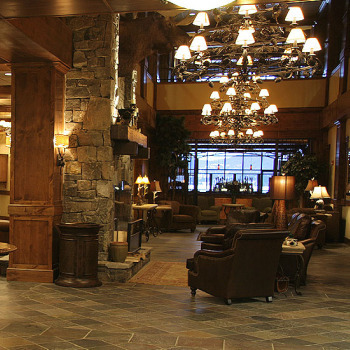 Equipped with elegant suites featuring mucho space, crackling fireplaces, wonderful bathroom amenities, gourmet restaurants, and a world class spa, the Lodge at Whitefish Lake is a first-class choice, and perfect for a stellar Girlfriend Getaway. The lodge is as superb as the view that surrounds it. Located a mile from town and just minutes from the slopes, you can ski all day and then either choose to explore the vibrant nightlife in Whitefish, or just laze around this warm, full-service resort. Get toasty in front of the fireplace, soothe those pleasantly aching thigh muscles in their outdoor hot tub, or recount your day’s adventures over a gourmet dinner at The Boat Club lounge and restaurant. I created my own afternoon delight package which I call “A Huck of a Good Time.” It starts with a little sustenance from the Coffee Shop—a cup of huckleberry tea and a steaming hot huckleberry muffin. Off to the spa for a life-altering Deep Tissue Bodywork massage followed by their fragrant Huckleberry Body Scrub. You’ll finish in time to grab a seat at the bar, camera poised to capture an extraordinary sunset shot over Glacier National Park, while sipping a signature Huckleberry Martini. Highly advised is that you pair the martini with the fantastically fattening Boat Club Chips—homemade sweet potato chips that you dip in a sauce of melted blue cheese/ranch dressing. Divine! Pat, a Louisiana transplant (ergo the wide selection of home-style Southern dishes on the eclectic menu) runs a jumping Whitefish restaurant that combines a good ol’ time with some seriously good food. A girlfriend and I shared almost every Cajun/Creole dish on the menu and found each to be better than the last—manageable if you order “tapas style” and stick with the starters and second plate offerings. 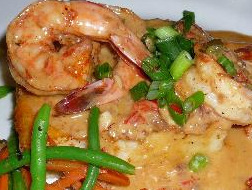 Can’t miss selections: Grilled crawfish cakes, the hot and sassy Looziana gumbo, signature shrimp and grits, herbed chicken and dumplings. All of these paired beautifully with my Elk Cove Riesling—highly recommended. Tip: After a day of skiing, calories be damned. Don’t even think of leaving without trying their rich, rummy, decadent bread pudding. Café Kandahar: Sadly, I was not able to personally experience this restaurant, especially because Chef/Owner Andy Blanton (another Southern boy) was just nominated for the “Best Chef” category of the 2010 James Beard Awards. Also, a fellow foodie on our trip had waxed euphoric about the dinner he had experienced there on his last visit: an eight course extravaganza showcasing locally-cultivated products and wild game, masterfully paired with some exceptional wine. Each skier gets more than a whole acre all to themselves—that’s from the 3,000 acres of skiable terrain, which range from the so-called “bunny slopes” to “yikes!” Covering the hill are 300 inches of pure powder, and to boot (no pun intended), your choice of ski-in, ski-out lodging ranging from budget to luxe. When you get to the top of the peak you can see all the way to Canada, and it is breathtaking. It’s possible to ski all four sides of the mountain, so that you almost never get swarms of people clogging up the hillside. During my afternoon, a “long” wait for the lift meant that there were about six people in line ahead of me, and one time, my instructor and I had the run all to ourselves, all the way to the bottom. Speaking of instructors, they were fan-TAS-tic. Even though I hadn’t put on a pair of skis in far too many years—so many, in fact, that I was startled to see that skis are now about half the length that they were when I was last on the slopes—my awesome coach, Lori, had me at level 5 by the end of the day—and that was 5 out of 9, not 100! She used all sorts of helpful visuals to get me up to speed and could not have been more patient. With her help, I went from bumbling klutz to slick ski-bunny in just a few hours. 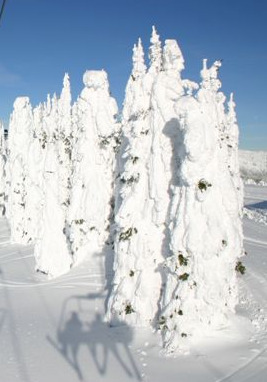 Fun Fact: The Mountain is decorated with these unique snow-ghosts—exotic snow-covered, Edward-Scissorhands-looking trees that look eerily lifelike. Two-day Learn-to-Ski packages start at only $69! Ski and sleep for a song: Take advantage of their value-packed package deals, starting at an amazing $70/ night for lodging and lift tickets! I mean, really, my girlfriends and I often spend that much just on dinner. What a steal! Nice touch: Love that free S*N*O*W bus that shuttles you from your lodge to either the slopes or downtown, so no need to rent a car.